The Jersey Basket quilt block is a another easy block because it contains only squares and half square triangles. It is constructed in the method of a four patch, by dividing the sections of the block into quadrants and then sewing those quadrants together. 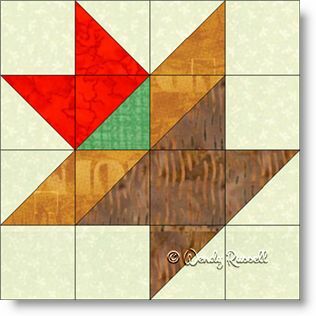 All in all, this is a wonderful block to get you started on your quiltmaking journey. The two sample quilts illustrated show the quilt blocks rotated here and there to create a secondary pattern, or just to have a flow to the quilts.